BRP has taken its popular Modular helmet and reworked it with a new shell and improved visor. The Modular was introduced in 1998 as the first helmet designed specifically for snowmobiling with standard dual pane visor and breath evacuation system, along with the moveable jaw piece. The newest version, the Modular 3, keeps all the features of previous designs like standard one touch adjustable sunshade operation, push button jaw piece that can be operated with gloves on, quick release chin strap and room for eyeglasses inside, while improving in key areas. Most noticeable is a new rear shell that has an edgier design that BRP says features more consistent sizing. “Plus the Clear Vision Technology visor that has improved quality in clarity and durability – which when combined with the proven BREATH EVAC mask system – deliver on one of the most important aspects of this pure snowmobile helmet, clear cold weather vision,” BRP says in a release. As well, these visors are injection moulded in one piece rather than glued or taped together for a consistently clear view. The Modular 3 comes in six different versions to match your style. 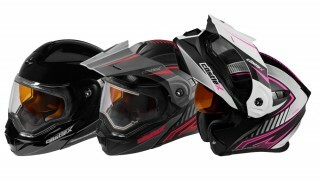 The Men’s X-TEAM Gravity Helmet and Ladies’ Diva Helmet feature ink transfer graphics designed to resist scratching, plus there are four solid colors available too: White, Grey, Black and Hi-Vis Yellow. Modular 3 prices start at $299.99 USD/$329.99 CAD. For those that want the extra security of a heated visor, you can add it as an option to any Modular 3 Helmet, or get it standard on the Modular 3 Electric SE Helmet available in black. Visit www.store.ski-doo.com for more information.